To make dressing, combine vinegar, lemon juice, and lemon pepper in a medium bowl; whisk to blend. Slowly add oil while whisking; mix well. Evenly divide dressing between 4 one-quart Mason jars. Set aside. 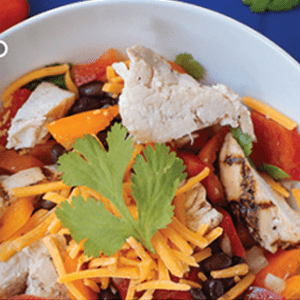 Evenly layer beans, bell peppers, onion, tomatoes, chicken, cheese, and cilantro on top of dressing in jars.